This popular early variety produces an abundance of dark green strait pods about 4.5 inches long. 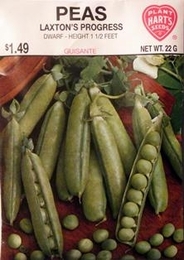 Each pod contains 6 to 8 large peas. This early summer favorite is highly resistant to fusarium wilt. This variety can be grown without support. Planting in double rows 6 inches apart will provide additional support where necessary. Make repeated planting for continuous supply all season.